Some people move on, others don't. Andrea returns to her hometown for the weekend and discovers a ghost that is as much of a slacker as her. Together they aim to solve their problems. Maybe. This is the end, at least for us. I want to leave the next step in Andrea's life up to your imagination. 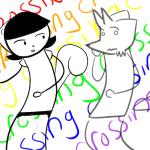 In terms of me making comics, I will be announcing something soon, although it won't be in the same universe as Crossing. No Marissa, you're awesome. Thanks for reading! I'm so crying right now. You're awesome!